Head on over to the tutorial at paintandpattern.com to see how to stencil a closet nook bench like this. It’s actually pretty easy to get a high impact look like this. 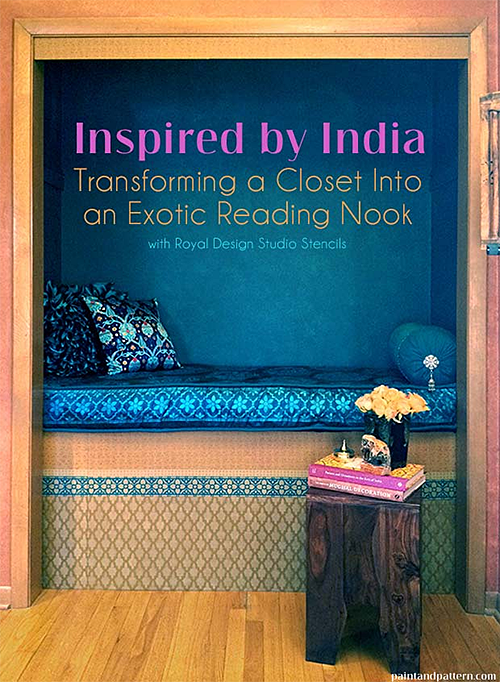 Four stencils + four colors of paint + MDF board = a little reading nook that looks like it came straight from India or Morocco! 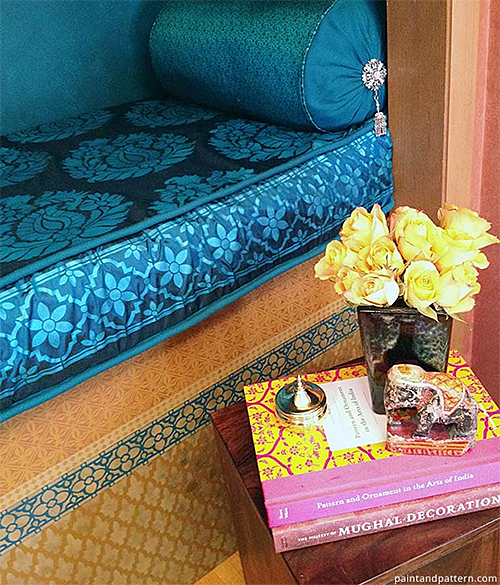 The stencils shown here on the bench’s front came from Royal Design Studio’s Moroccan stencil collection. I’ve had these stencils for many years. I bought them for my first trip to our apartment in Chennai, India back in 2011 and intended to paint a little alcove between the apartment’s bedroom doors with this exact combination of patterns. The finishing of that apartment is on hold until we can give it the attention it needs to avoid big, expensive mistakes. (We’ve already had some happen and have no appetite for more!) 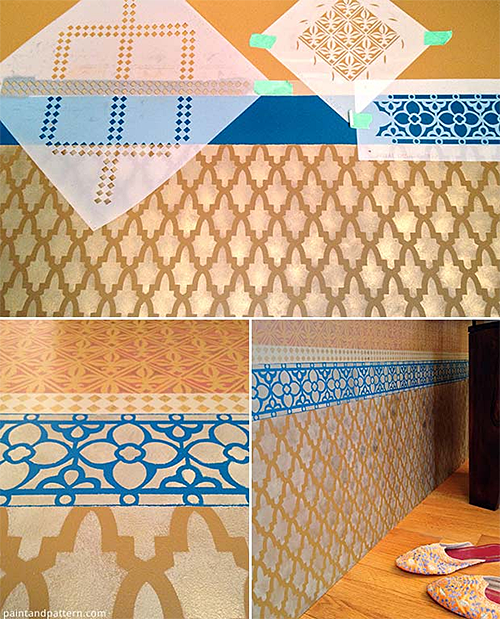 So … I decided why not create a little corner in our Chicago home with these stencils, so we can enjoy it … here and now. This project was so fun. I look forward to enjoying this nook. My husband’s home office is in the room next door, and he’s in there all the time, like I swear he works 18-hour days. Really. So I will likely camp out in this nearby nook a lot. And because this nook, and the whole room it’s in, is all “me” and reflects my love of global-inspired spaces, this spot may become my “office” and the space will inspire many more global design blog posts to come! If you think you cannot spare a closet for a spot like this, well, I didn’t think I could spare the storage space either. But I learned I indeed could give up a closet, and shared that story previously. I also shared a few weeks ago, how to paint new walls to look old, like the mottled teal color walls in this nook. This is fabulous. I have partnered with Jaypore for a Giveaway on My Dream Canvas. It would be lovely if you would stop by and enter. The Giveaway has some awesome stuff from India! Thank you so much, Anu! I will stop by your blog right now! I love those cushions and the fabric covering the mattress. Where did you get those from? Hi, that is coming in the Part 2 of this post! I made the cushion. The fabric is silk dupioni and the pattern on the fabric was painted with stencils. It’s filled with a big foam piece that I had ordered cut to fit the space. I will do a post all about sewing the cushion. And the pillows … the ruffly pillow in the back is from Pier 1 – they have those pillows right now. The square pillow with patterns on it is from Arastan in Bangalore, India although that store has closed now. :( It was a great store. And the round bolster pillow, I sewed from a silk fabric. I will do a post in the future all about sewing pillows. This is kind of an entire DIY’d nook! Thank you Linda – yes this is a fun project and a much “better” use of space! I’m so glad you like the blog!! This truly is a labor of your patience and creativity……the jewel tones are fabulous. Just LOVE the way this turned out !!! *Thank you! * And you are right, yes, it was a labor of patience as it took a lot more time than expected. But the result was worth it! Holy Mackarel! Amazing. So inspiring. Thank you Kamini! We have guests coming soon from India who I hope will enjoy it!